I thought I would do a quick blog post about it since it's beauty related and I really want to share this one with those who may not have Instagram. 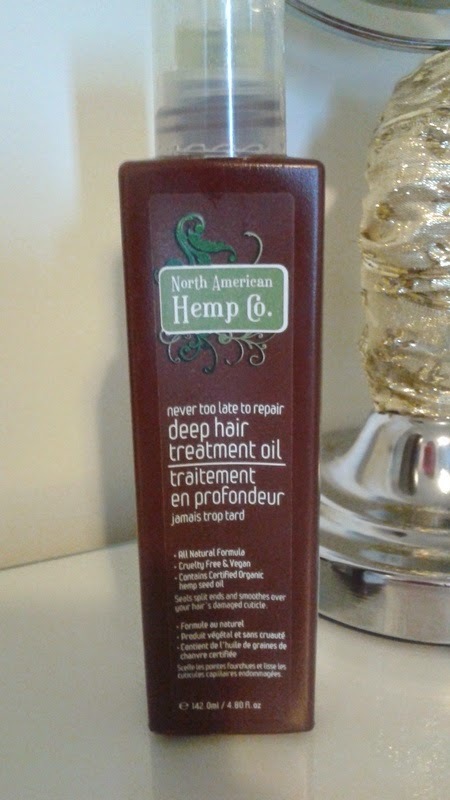 My current hair care love is North American Hemp Co's "Never Too Late to Repair Deep Hair Treatment Oil" I bought this on the recommendation of a friend. I use this oil every time I wash my hair. Regardless of whatever styling products I decide on, I mix this in with it which helps it to spread throughout your hair more easily since it's a blend of oils and not a silicone based product. Unlike other oils that sit on the hair, this one really seems to penetrates the hair, and my hair is healthier from using it. I only use 1 pump, a little goes a long way! You can use it on wet or dry hair but if your hair is fine use very little. I imagine this would also be great on thick or ethnic hair types. Directions: Add a little to damp hair for shine that lasts all day. Leave on overnight for the ultimate hair and scalp rejuvenation, for tomorrow’s brilliant frizz-free style. I found mine at a Winners or Marshalls for only $6.99. What hair products have you been loving?